On Wednesday, local establishment Pizzaburg Pizza in Mt. Gilead held a fundraiser at each of its stores and donated 30 percent of the sales that night to local police departments. 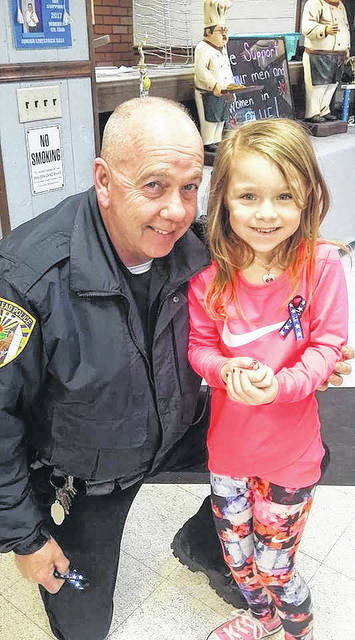 Ryliee took her ribbons and was able to raise $200 for the Westerville Police families. Ryliee’s police ribbons also will be available soon at Dear Downey in Galion. Owner Kaela Downey has also been fundraising for Westerville police through the sale of t-shirts at her business. Downey and Hammond are cousins, so coming together to support this cause was an easy decision. https://www.galioninquirer.com/wp-content/uploads/sites/38/2018/02/web1_28055692_10216488497311174_3672558114117818617_n.jpgNorthmor second grader Ryliee Hobson is pictured with Capt. Kenny Underwood of the Mount Giliead Police Department. Hobson has been making ribbons and donating all proceeds to support the Westerville Police Department.